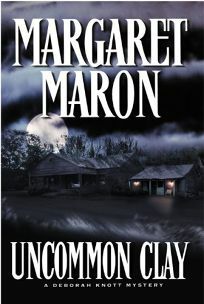 In this eighth book in the Judge Deborah Knott series (after 2000's Storm Track), Maron employs spare, straightforward prose and the languid language of the Carolina Piedmont to spin an exceptionally gripping tale of hate, jealousy and murder. Still smarting from the betrayal of her lover, Kidd Chapin, the redoubtable jurist travels to Randolph County, N.C., in order to settle the equitable distribution of the marital property of a pair of freshly divorced potters, Sandra Kay Nordan and James Lucas Nordan. Before she can finish her legal duties, however, somebody bakes James Lucas in a kiln. Deborah's own sense of loss in the wake of Kidd's rejection helps her empathize with patriarch Amos Nordan's multiple tragedies (another son died two years earlier) as well as a hired woman's grief over her retarded son. Amidst a beautifully evoked flowering spring countryside, Deborah pursues the murderer with her usual keen eye and common sense. If the book fairly swells with passion, a healthy dose of Southern humor keeps things from getting too maudlin. By the time the story reaches its dramatic conclusion, readers will be in mourning, wishing the end hadn't come so soon. Maron's mastery of jurisprudence, her well-researched depiction of the potting world but especially her sensitive portrayal of human relationships raise this novel far above the ordinary run of mysteries. (May 22)FYI:The first Knott novel, Bootlegger's Daughter (1992), won all four top mystery awards—the Edgar, the Anthony, the Agatha and the Macavity. Maron, who's also the author of the Sigrid Harald series, will be the guest of honor at this year's Malice Domestic Convention.